Add a game to your Owned list that was previously in your Wish list. Play a specific game 20 times. The stalwart adventures gather together at the entrance to the dungeon. Lighting their torches, they enter in! What will they find as they drive deeper into the darkness? Will it be treasure or the dreaded dragon? In Dungeon Roll, players take the role of an adventuring party, fresh from the tavern and ready gather some loot. Be wary for as you go deeper into the dungeon, there may be more monsters that come out of the darkness, ready to stomp your party and send you back to town with your tail between your legs. Dungeon Roll consists of players taking three delves, in which they will go as far as either they feel their luck will take them or until the monsters defeat them. Each player is dealt a character card at the beginning of the game, then, at the beginning of each delve, the active player will roll all seven of the party dice. Then, another player will roll one of the dungeon dice. The active player will then either use on of their party dice to react to the dungeon dice, be it to defeat a monster, quaff potions or open treasure chests. After the monsters have been defeated and any other dungeon dice have been either used or ignored, the active player can then decide if they want to continue. If they choose to continue on, they enter the next level to the dungeon and even more dungeon dice are rolled. If they decide to retire and head back to town, they gain experience equal to the level that they completed. This continues until all players have had a total of three delves. I really like this game. It is a light game that takes only a few minutes to play, so it is great for downtime between games. As far as the box goes, my wife and I bought a small treasure chest at Gen Con that has a hidden tray in the bottom of it. It works perfectly for holding all the dice, cards, rulebook and experience tokens on the top shelf, and all the treasure tokens underneath. If you are looking for a small game to bring to your gaming groups that plays quick, you should definitely give Dungeon Roll a try! The world has descended into chaos, as a zombie outbreak has occurred. It is just you and your small band of survivors against the endless hordes that want nothing more than your tasty, tasty brains. Time to gear up, go out and smash some zombie heads in a cooperative slugfest and commit some Zombicide! In Zombicide, players will have to work together to defeat the hordes of the undead and complete their objective. Objectives can range from finding certain items to leveling up to the max with a character or even just getting out of Dodge! These objectives are determined by the scenario that the players decide to play. After the scenario has been set up, the first player takes up to three actions. These actions could be to move a zone, search (if in a building or the same zone with a vehicle in it and no zombies), open a door, enter a vehicle or fight zombies. If the player decides to open a door to a building that has not yet been explored, they will then have to populate the entirety of that building, drawing a zombie card for each room and placing the appropriate type and number of zombies based upon the highest player level (if one player is in the orange zone, place by using the orange zone on the card). If they search, they draw from the equipment deck. Combat between a human and a zombie is done using equipment cards. Each card that can be used as a weapon has a series of images on the bottom, depicting range, amount of dice rolled, the target number for successes and the amount of damage done by that weapon. For each success, you do the amount of damage listed on the card to a single zombie. Most that you come up against can be taken out fairly easily, but a few require more damaging weapons to end their undead existence. After each player has taken their turn, it then becomes the zombies turn to act. Each zombie gets a single action to either attack or move, except for the runner who gets two. Any survivor unlucky enough to be in a zone with a zombie will be attacked, which makes the survivor discard one item of their choice (if any) and they have to place a wound card in their inventory. Any player that would receive a second has been overwhelmed by the undead. After all the zombies have either moved or attacked, any active spawning zones placed around the board spawn new zombies, using the same method as with populating the rooms in a building. The game continues like this until either the players have met the victory conditions or all have fallen to the undead. I love this game. It takes aspects of games like Last Night on Earth and Left 4 Dead and combines them into one game. The co-op nature of the game fits very well with the theme and the rules are easy to teach to new players. My wife and I had the good fortune of being able to back this on Kickstarter and get all the bonuses along with it. If you are a fan of cooperative and zombie games, look up Zombicde. You won’t be disappointed! Flash Point: Fire Rescue is a unique game that puts players into the role of firefighters, trying to save people from the raging inferno and live to see another day. It uses an action point system and (in the advanced game) player abilities to help stem the flow of the fire and rescue the civilians trapped inside. But be warned of structural damage, for if the building takes enough, it will collapse and crush all inside. Are you prepared for the heat? After all the tokens for fire, hot spots, haz-mat, doors and the Point-of-Interest markers, each player has a number of actions that they can take, which is generally four. These actions range from moving, putting out smoke or fire, chopping holes into walls and rescuing civilians. They can also reserve up to four actions that then allow them to have more actions available for their next turn. After the active player has done all that they can or want to do during their turn, they then roll a ten-sided die and a six-sided die. This gives them the coordinates for placing smoke which, pending on where it lands could create another fire or an explosion. When playing the game and placing smoke, there is a simple equation to remember: Smoke + Smoke = Fire, Smoke + Fire = Explosion. After this has been resolved, the player rolls both dice again to replace any Point-of-Interest markers, if needed. This continues with each player until either seven victims have been rescued which results in the players winning, or either four victims are lost or all the damage markers have been used and another would be placed making the building collapse, which then means all players would lose and have to lick their wounds until the call rings out again! This is one of my favorite games. I absolutely love the theme and the miniatures that come with it are great quality. If you are a fan of cooperative games and fire-fighters, this is definitely a game to look into! Tales of The Arabian Nights is equivalent to a choose-your-own-adventure book with a board attached on to it. But that is what makes it so unique. As you go around the board, trying to collect treasure and complete quests all in an attempt to gain Story or Destiny point, the tale that is weaved into your character quite literally becomes one to be told of for games to come. Like when you try to trick a genie and get turned into a giant monkey, or when you find a spring in the desert and drink greedily from it only to find out that you’ve now had a gender-change. Or, after a long and arduous journey, you finally return to Baghdad and are able to marry the love of your life. Everything in this game becomes a story that makes it so that all players walk away feeling good about it and wanting to try it again, to see what will happen next time. After all players have chosen their characters, they select from pools of Story and Destiny points, picking a total of twenty points in secret to determine their victory formula. When choosing, Story points allow for a bigger tale to be weaved, whereas Destiny points help to dictate you actions. Then, each player gets to choose three skills to aid them in their journey. After all players have chosen their skills, they receive Quest card. The Quest cards help to give a player a direction in the game, and can range from being able to weave the greatest of tales or becoming the king of thieves. Players then proceed to move around the board. When they finish their move, they draw from a stack of encounter cards. On each encounter card, there are numbers that direct another person (the reader) to look into the Book of Tales. The active player then rolls two dice and adds any modifiers to the number. This directs the reader to announce what type of encounter it is and where the options for it are on the reaction matrix (ex: a “powerful” beggar on matrix J). When the active player chooses their reaction, they will then roll the destiny die to see if anything is added or taken away from the number. Based upon that result, another player holding the Reaction Matrix will tell the reader what numbered paragraph to look up in the Book of Tales. As the reader reveals what happens, any skills listed in the book that the active player has can be used to change the outcome. But be warned, for sometimes, these skills could hurt you rather than help you. After this has been completed and an the any gained Destiny and Story points, Statuses or Treasures have been resolved, the game goes to the next player and both the Book of Tales and Reaction Matrix are passed to the next in line. And this will continue until someone reaches the predetermined amount of Destiny and Story points, reaches Baghdad and announces that they are going to win. After this, all remaining players have one final chance to reach Baghdad and potentially steal the victory. The story telling aspect of this game is a lot of fun, and helps to keep all players involved with what is going on. And the Book of Tales has roughly 2,600 different paragraphs, making the replay value almost infinite! Some people might be scared off when they see the Book of Tales, especially if they think that it is the rulebook! Also, when playing with six players, some players might lose interest while waiting to get involved. With the Book of Tales and Reaction Matrix, three players are always involved with the story. This game is a lot of fun! I was perusing through some games list one day and came across this gem, showed it to my wife who promptly showed it to some friends of ours and it has spread like wildfire. Whenever we bring it our Friendly Local Game Store, we never have a problem getting player to join in on a game of Tales of The Arabian Nights. This game is best with three players, because then all are doing something, be it moving around the board, searching through the Reaction Matrix or reading from the Book of Tales. If you are a fan of storytelling games, then this is the game for you! During Gen Con, I took a look at this game and originally, I wasn’t too impressed. I thought, “this is just a clone of the Lord of the Rings card game.” And then I finally played it. Wow, was I wrong. Although this is a cooperative game and you have to build your decks to play it, it plays different than other games of the same style. As you go along, you gather up allies, treasure and equipment, all while trying to find the villain before time runs out. So each game becomes a strategy of moving and collecting. The level-up system that the game has allows for players to create a character unique to them and gain strength for the oncoming hordes of ancient skeletons. But watch out! Your deck starts at a lowly 15 cards, and when it runs out, your character dies and can’t be used in future sessions. My vote for this game is that if you are a fan of adventuring with friends or even if you are more of the solo player, then you should definitely look into the Pathfinder Adventure Card Game. This is one of my favorite games. I love the art style, the cooperative play, and just the overall design of the game. When my wife and I first bought it, we played it once and really didn’t think that much of it. We both played a single hero apiece and were quickly tromped by the villain. Left with feelings of doubt over our purchase, we took a camping trip and decided to give it another shot. We both played 2 heroes, giving us four protectors of justice to thwart the vicious Baron Blade, our current nemesis. After losing two heroes and barely squeaking out a victory, we instantly fell in love with the game and played it almost the night through. This is my go to game for any group for it’s diversity of characters and strategies as well as it’s ease of play. Sometimes it is a good strategy to follow players around just outside the Mummies’ Corridor. Since it takes an action to open a sarcophagus and another to actually pick up the treasure, some players will open it up and not have the action to get the treasure. This allows for a quick pick-up and helps to keep you out of the Mummies’ reach. When you start to draw hero cards, plot out who to go after, and share the cards with people that have a better chance character-wise of winning against a general. For example, the Dwarf is great against Dragon-kin. Get him as many cards as possible to go against Sapphire. But don’t focus on only one character going against the general. Remember, there is strength in numbers. If you have 4 characters on the field, try to plan it so there are always two ready to attack the general. Your Turn: Why do you play games? Why do I play board games? It is because of the community that gathers around board games and the fellowship therein. My wife and I were introduced to the world of board games shortly before we were married by here brother and a copy of Last Night on Earth. 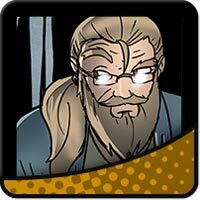 From that single games of survivors trying to outwit the stumbling hordes of the undead, our experiences (and collection!) grew exponentially. We have made new friends, rekindled relationships with old comrades, and come away from each with stories to tell. And we have gotten the joy of watching the community around us grow and the relationships and stories that are intertwined within. My name is Jacob, and I am an Associate Editor for Initiative: Tabletop. I love games like Sentinels of the Multiverse, Pathfinder: The Adventure Card Game, Flash Point: Fire Rescue, Talisman and Tales of The Arabian Nights. When not slaying dragons or rescuing civilians from an ever-spreading epidemic, I love to paint minis, design new terrain, vacation on the beach, go camping and spend time with friends and family.